The RCW 57 complex (Rodgers, Campbell, & Whiteoak 1960) consists of several H II regions distributed over an area of -60' x 40' in Carina. The western and eastern parts were designated, respectively, 38a and 38b, in Gum's (1955) catalog. 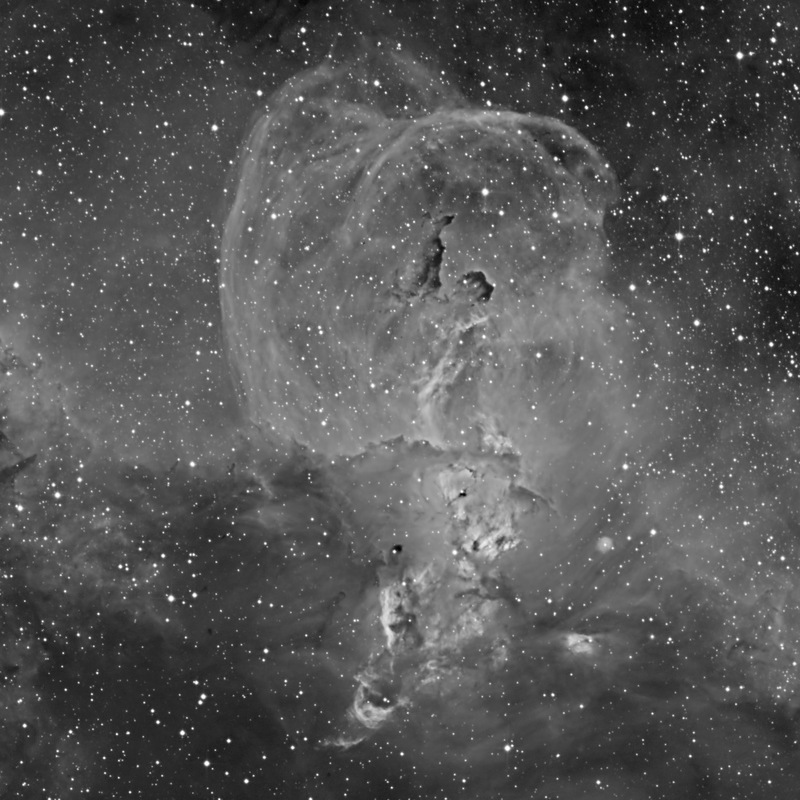 The fan-shaped complex Gum 38a contains several bright knots (NGC 3576, 3579, 3581, 3582, 3584, and 3586), which are embedded in a large system of diffuse emission, gas filaments, and dust patches. The central part of Gum 38b is NGC 3603, which designates also the rich star cluster embedded therein. 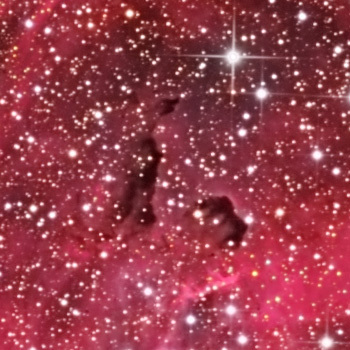 Gum 38a and 38b are two idividual complexes of molecular clouds, at different radial velocities. When John Herschel discovered these nebulae in 1834 he could only see several bright nebulous patches and eventually this nebula received six separate classification numbers. 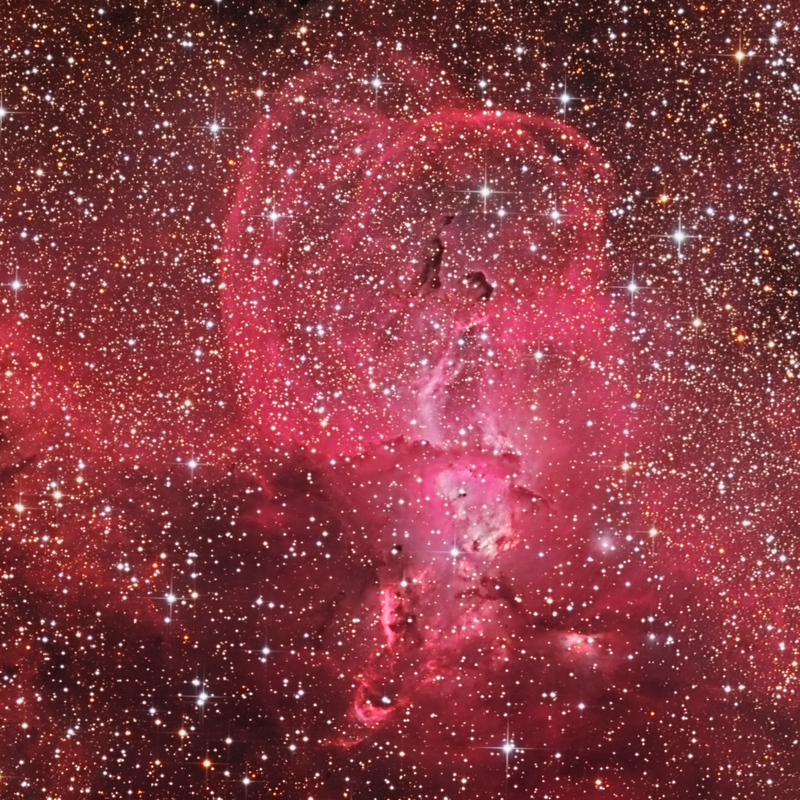 NGC 3581-82 are the brightest of a group of the gaseous nebulae in a rich starry field. The northern portion of the complex is catalogued as NGC 3579 and NGC 3584, while two detached faint patches lie close south-west and south-east, these are NGC 3576 and NGC 3586 (see the annotated image). The giant HII region NGC 3576 is ionised by a large star cluster visible in the infrared and at least 10 times brighter than the Orion nebula. Curiously for such a prominent HII region, no very hot O-stars have yet been identified in the central cluster. 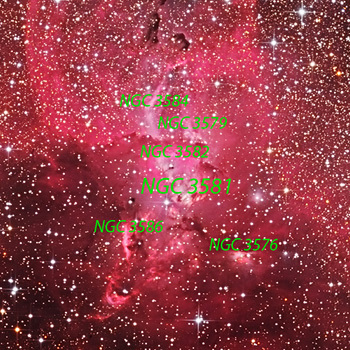 These days astronomers usually call the entire nebula NGC 3576 or Gum38a. 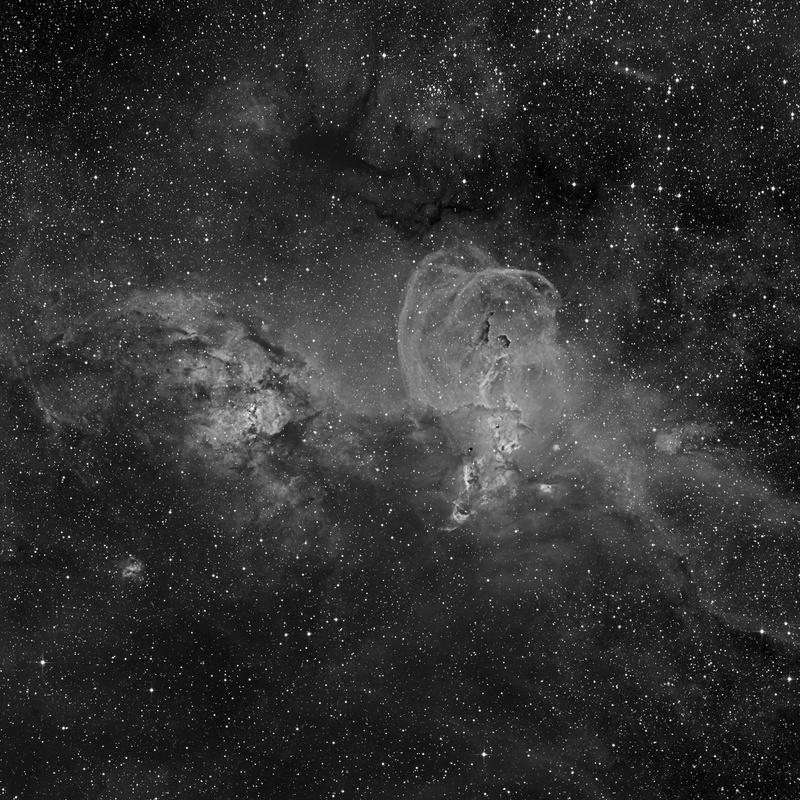 In the north of the NGC 3576 are these two dark nebulae. They both have a diameter of about 2 light years, and they are dense concentrations of gas and dust. These compact dark structures were first described by the astronomer Bart Bok (1906-1983) in the 1940's. 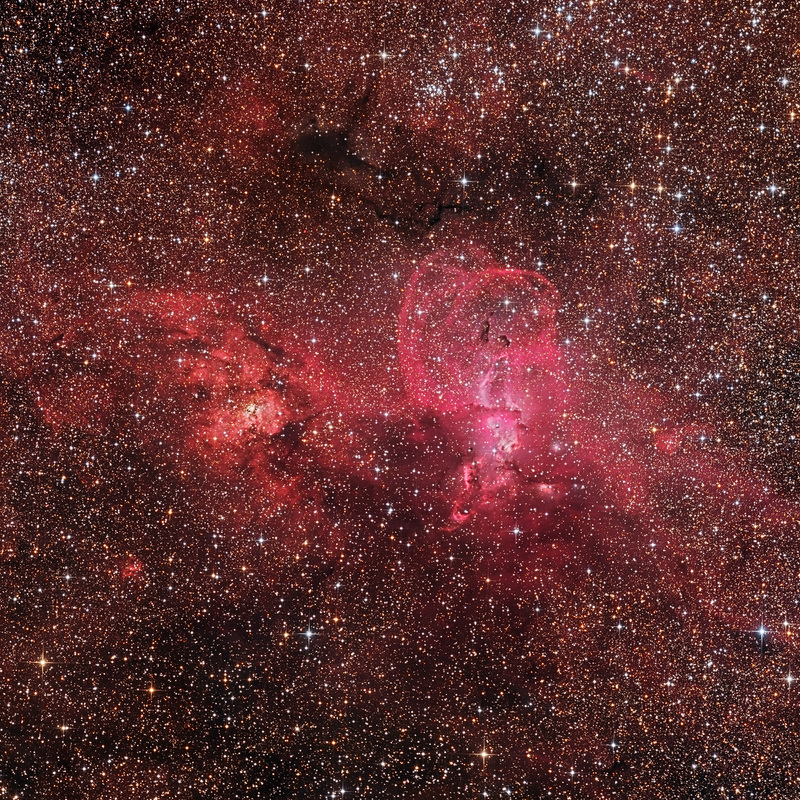 Bok Globules are small dark clouds of gas and dust that are found in HII regions and typically have a mass of about 10 to 50 solar masses. These globules are about 1000 times the diameter of our solar system. 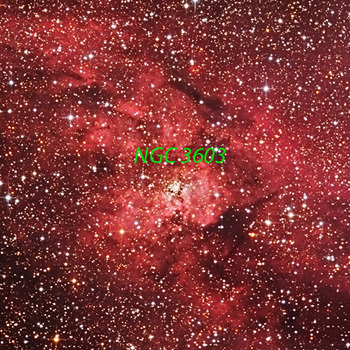 NGC 3603 is an open cluster associated with a nebula visible to the east. 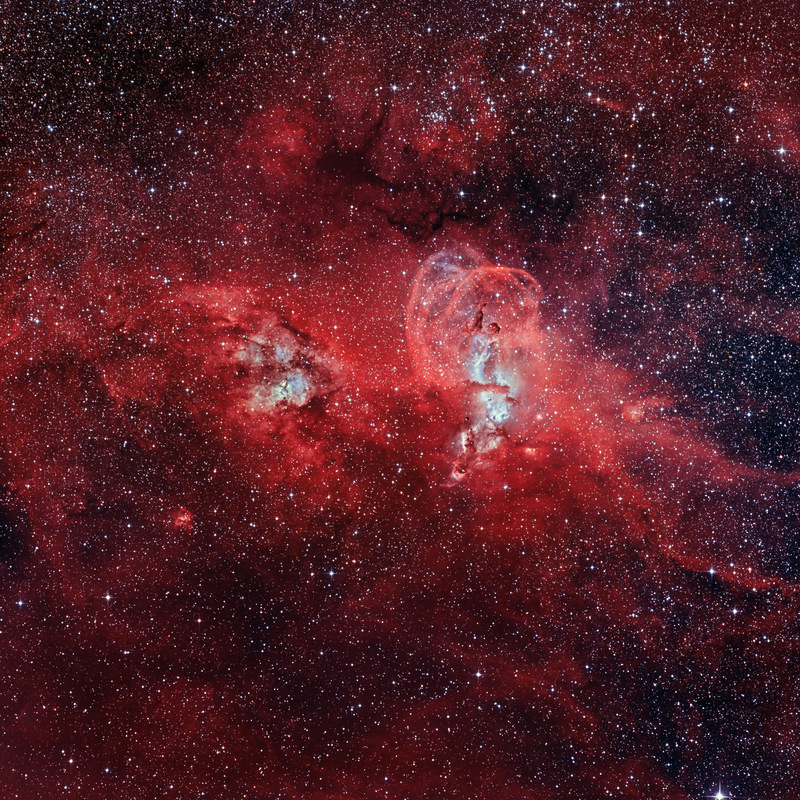 This is an enormous obscured HII region which probably extends over 1000 light years of space. It is ionised by an extremely dense starburst cluster. A 2004 study identified 14 O-stars (7 ultrahot class O3) and 3 Wolf-Rayet stars in the cluster core, which includes the massive multiple star system NGC 3603YC. The color difference between Gum 38a and Gum 38b is striking. The reason: Gum 38b (NGC 3603) on the left is twice as distant, which is documented by the blue extinction in its color as compared to its neighbour Gum 38a (NGC 3576). 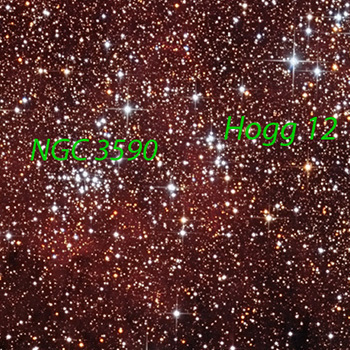 Hogg 12 and NGC 3590 are open star clusters located to the North of NGC 3576. Both clusters are surprisingly small objects whose radii are barely ~3.26 ly (1 pc), and they are separated by scarcely 12 ly (3.6 pc). These facts, added to their similar ages, reddenings, and metallicities, allow to consider them a new open cluster binary system candidate.